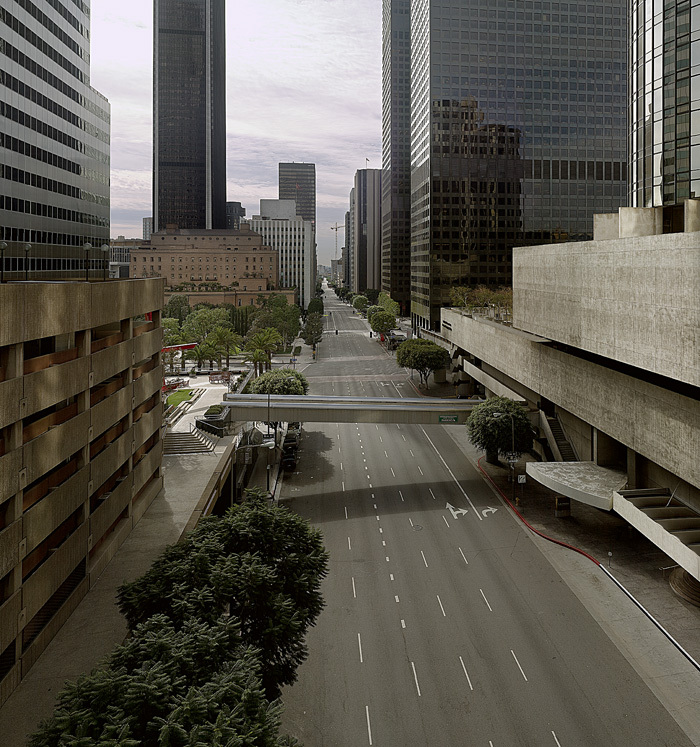 Photographer Matt Logue’s created images of the wide streets of Los Angeles absent automobiles. 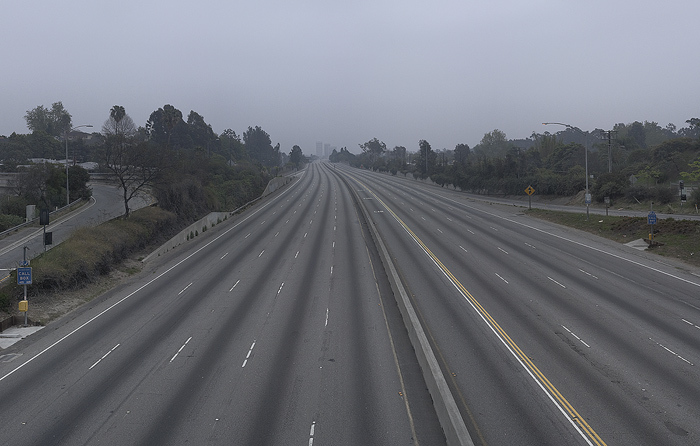 His photographs are now published in a book, Empty LA. I often have wondered what it would be like to live in this city without fighting the daily war of driving. 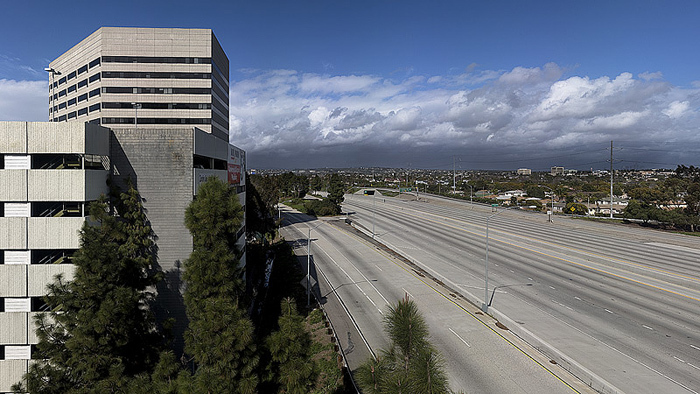 Like David Yoon’s Narrow Streets, Logue’s digitally manipulated fantasies of Los Angeles bring up the sad reality about how ugly, depopulated, empty and inhuman the main arteries and roads are. The architectural pathologies of Los Angeles…… the new modern grotesque monstrosities, the factory high schools, the high rise prisons, the Caltrans black glass behemoth downtown………… they will not go away even if the car does. You can subtract the cars, but the roads are still four times as wide as they should be. You can narrow the streets, but the buildings that line the road are ugly, blank, indifferent and cold. Los Angeles needs to rip up the enormous asphalt parking lots. Urban agricultural gardens should replace the big box shopping center monstrosities. Schools should set aside some land for residential, high-density walkable brownstones and cottages on LAUSD land. The enormous roads must be downsized by center tree planting, jogging and biking paths. Unsafe driving must be vigorously prosecuted and the fines for texting while driving, speeding, running red lights, and aggressive driving should be quadrupled. A 50 cent tax should be instituted on every gallon of gasoline to finance region wide train, bus and light rail service. Let photographers photograph Los Angeles in 2060 without having to resort to digital manipulations. I actually like LA wide streets. When I lived in UK, the narrow older streets felt claustrophobic and there were no rooms for bikes, or foliage. It was charming, but only if you lived in rural areas. In denser neighborhood, it was more depressing than LA’s wide streets. For me the biggest urban blight is people’s selfish (it’s all about me) attitude, fostered by living beyond our means (heavily subsidized gas), and encouraged by lack of rules enforcement (loud vehicles, speeding, etc). We might be able to change the last 2 somewhat (though it won’t be too easy), but how do we change attitude? How do we get to an “ubuntu” state of mind?